The Jack Sack™: "SACKS OF SUPPORT" Series: The Beastmaster Sack! In Jack Bauer's final two hours of Day 5, sacks from around the universe are declaring well-wishes and public support for our hero. You know who these little bastards are- it's Kodo and Podo, travel buddies for The Beastmaster! They're pretty darned cute, I have to admit. 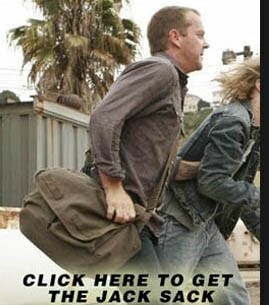 Sure, they have nothing to do with Jack Bauer or "24" for that matter, but they do travel in a sack, and they are useful allies whenever The Beastmaster is in a tight situation. But as with most wholesome images, there's usually a darkside to the whole affair. Most grown men feel uncomfortable around ferrets. I think I could be counted among them. I can't explain it, but there's gotta be something wrong with a dude running around the wilderness with two furry critters in his sack. 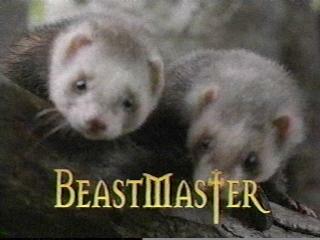 And let's just say that The Beastmaster was a little too close to these fellas. I guess you could file Kodo and Podo under "Things You Will Not Find in The Jack Sack," but let's try and see beyond our discomfort of ferrets and try to look at what advantages they offer to a man in danger. Kodo and Podo ask that Jack Bauer consider them as new team members at CTU, as they are proficient in hacking into Dept. of Defense servers, they are good at negotiating plea bargains with useful suspects (drop one in Henderson's pants and watch him give up the conspirators! ), they can each carry a 9mm clip on their backs too. 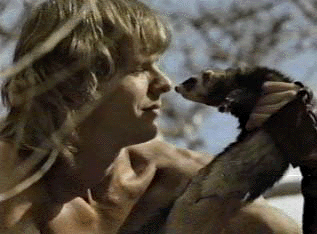 Most of all, they need to get away from The Beastmaster. They need a new sack to call home.